You are your child's first and most effective teacher. Endless opportunities present themselves during the course of everyday life to teach him everything from how to get dressed and do his laundry to selecting and wrapping an appropriate gift for someone else. All too often, we miss these little teachable moments as we scurry through the busy-ness of life. As any parent will tell you, the kid-years go by in a blur, so if you want to raise children who can one day live independently (and leave you to enjoy your retirement in peace), you need to begin capturing those opportunities whenever possible, before it is too late. Take a leaf out of the Scouts' book and develop a badge program to help you organize your thoughts on the skills you want your children to learn. Once there's a game plan, it's just a matter of seizing opportunities to implement it as they arise. It's easier to recognize those teachable moments as they come up once you've identified what they are. Find fun and creative ways to help them master each skill. For example, you can create personalized "stationery sets" for each of your kids to use as they work on a letter writing badge. A couple of old pocket folders with their names on the front filled with cards designed on and printed from your home computer, some envelopes, stamps, their own return address labels (again, printed at home) and some cool stickers to use as seals...and voila! Getting them to write their thank you notes will be easy peasy! Of course, a key element in the success of the badge program is the payoff from the perspective of your kid. By that, I mean a badge ribbon (pictured above) to proudly display in their rooms and show to all their friends, aunties and doting grandparents. Click on the button below for a PDF of the badge book we use and instructions for making the badge ribbon. 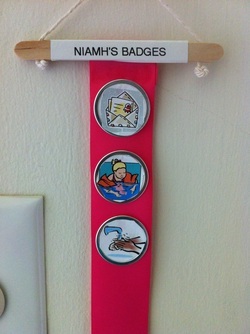 You may want to design badges of your own that are tailored to the age and ability of your own child. Feel free to share the links with other parents, and let us know what new badges you come up with! We'd love to get your feedback. The Girl Scouts and Boy Scouts of America are onto something big! Why not follow their lead down the path to your child's independence?! !